I haven't read the novel that The Book Thief is based upon but my partner, Enigma, has and informed me that, as is often the case, quite a bit is left out of the film. I don't think Enigma enjoyed the movie any less as a result but it did leave her thinking about the differences from the book. On the other hand I got to watch the story unfold as a movie with no such comparisons to make, just the film on its own merits. The story is set in Germany just prior to the outbreak of World War II. A young girl, Liesel (Sophie Nélisse) is fostered by a German couple, a fairly strict mother, Rosa (Emily Watson) and a more forgiving father, Hans (Geoffrey Rush). Liesel's love of books leads her to begin stealing them despite the fact that she can't read. Hans begins to teach Liesel and eventually her new found knowledge begins to affect everyone around her, including the Jewish stowaway her foster parents hide in their basement. My impression of this film is that it's essentially a 'slice of life' kind of film. It starts out painting a very vivid picture of what Liesel's life has been and then what it will be with her new foster parents. Then the Jewish boy arrives, who turns out to be the son of a man who once saved Hans life in the previous war. Much is made of an accordion Han's owns that he says once belonged to his friend. At that point I expected the story to pick up and escalate to some new danger because of something hidden in the accordion. Especially when Hans is seen fixing it. However that's not where the story goes and the accordion becomes important for entirely different reasons. The film, from there on, never really develops other than watching the characters reacting to life and the war as it unfolds around them. Which is fine. It's a very good movie that is well acted and, I imagine, is a fairly good representation of what pre-war Germany was like as Nazi-ism spread. You definitely feel for all the characters even some of the minor, supporting characters that are only in the film momentarily. You particularly feel for Hans and Rosa who are trying to balance being loyal German citizens against a political climate that they don't agree with but cannot speak out against. It did make me wonder about life in pre-war Germany. Supporters of Hitler and his Government are nearly always depicted as fairly severe, heartless individuals. Especially those working for the military. I find myself wondering if there were families in Germany that agreed with Hitler's politics but still came across as average, everyday, personable citizens who you'd be happy to invite over for dinner (just don't get them started on politics). 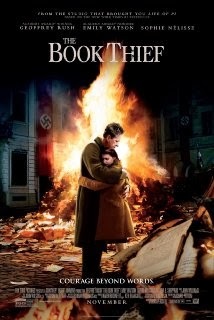 The Book Thief is not a particularly memorable film. Only Liesel has a fully developed story arc which ends in exposition. I would have much rather the film end with a little more flair, a little more show and a little less tell. Geoffrey Rush and Emma Watson are both very believable as German citizens speaking with English/German accents that don't sound cheesy or like a parody of the language. Sophie as Liesel really does carry the film - and is worth seeing in this role just as much as Geoffrey and Emma are worth seeing in theirs. Despite that, I didn't find too much of the story sticking with me after the film was over. For a pre-world war II film set in Germany I expected a lot more drama, intrigue and story than what's presented. After a very strong first half, there are dramatic moments in the second half that stand out but loose their impact by the way the film ends in exposition. I wasn't disappointed but it seemed like this film had more potential that really wasn't explored. Not essential to see in a theatre but you won't leave thinking it wasn't worth the price of admission. Sounds good. I did read the info about it on the Hoyts web site, but then forgot what it was about, as it was awhile ago. You can get an idea of what it was like for the countries that were invaded by Hitler's men from such as the comedy, ' 'Allo, Allo' even though it's from a humourous point of view admittedly. That was in France. Then you have the musical ' The Sound Of Music' which was based on a true story. They fled the country over the mountains to escape the Father having to join up with the Nazis. That was in Austria. I think people in the different countries were expected to follow Hitler's rules and ideas etc. Guardians of the Galaxy - Trailer Goodness.